ACTIVA CLAY ROLLER KIT Create fun and interesting designs with an Activa Clay Kit. It's easy to use for all ages. 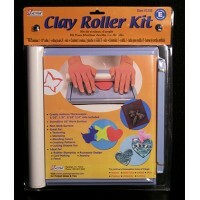 The clay roller kit allows the claymaker to texture, stamp, blend colors, create patterns, cut shapes and more. You can create scrapbooking designs, rubber stamps, jewelry pieces and other memorable objects. Each imported kit comes complete with one 10" clay roller, one rolling..